Well, it’s true that I hadn’t planned for a complete garden makeover. 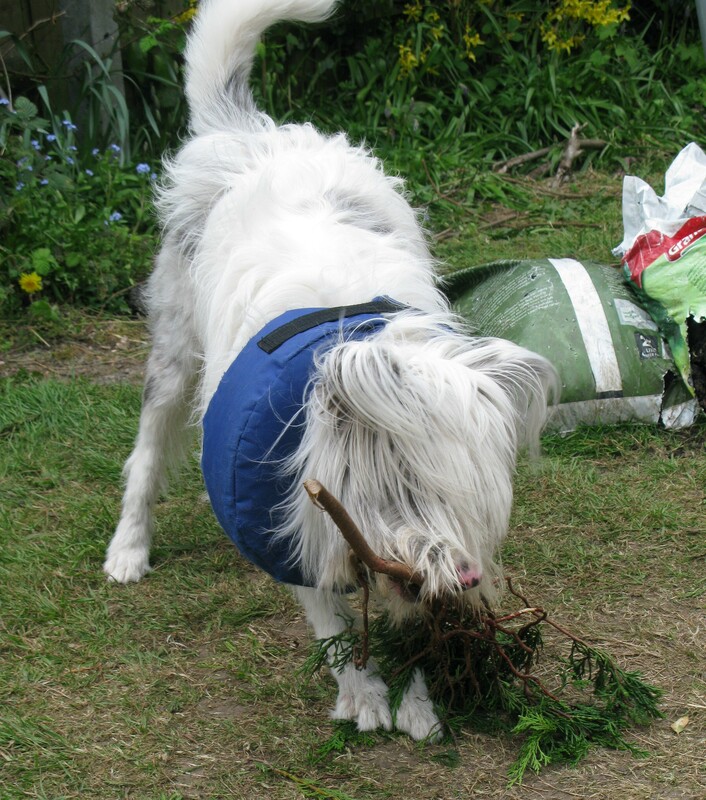 Before Isis arrived at the end of last August, I had taken great care to make my garden deaf/blind dog friendly. But, unfortunately, my deaf/blind dog isn’t garden friendly. Not in the least. Isis plays happily in the garden for hours and hours but I notice that the fence panels are disintegrating and keep a very close watch on Hairy One who loves creeping under, over and through any perceived barrier. However, this week my friend C. gives me ten six-foot fence panels in excellent condition. In order to put them up I have to remove copious amounts of lylandii branches which have grown over from my neighbour’s garden. Isis, who loves all things springy, thinks the branches are wonderful. The panels have to be lifted about three feet above the ground so that they can be dropped into the channels of the concrete grandfather posts. It is really a two person job. But I am working on my own and have to invent a way of sliding them up onto a garden table before standing on a stepladder to lift them the final foot or so to drop them in. I am very pleased with myself. I have erected four of the panels so far. And when, inevitably, I fall from the top of the step ladder, I land softly on a large heap of leylandii cuttings. I also liberate four green garden chairs from a skip down the road. They look good with the wooden table my neighbour gave me yesterday. On the table are a bottle of pils, a bottle opener and Isis’s Salami Sticks. Between each panel, we sit down for refreshments. All in all, Isis and I are having a very good time! This entry was posted in deaf/blind dog plays, Uncategorized and tagged deaf/blind dog plays, Isis plays. Bookmark the permalink. I know what you mean. Once I force myself out into the garden and get going, I can carry on for hours. And you feel so self righteous afterwards.